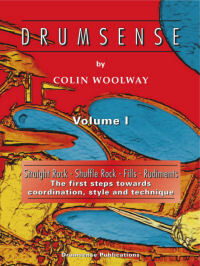 Drumsense Volume 1 is aimed at beginners and takes the student through 11 basic rock beats and applies 5 hi hat disciplines, creating 55 rock coordinations. In this way, the student is introduced to foundational techniques that any beginner should master. The chapter relating to �fills� shows the student several subdivisions of a 16th note roll, ranging from simple to very syncopated, and gets the student to orchestrate these subdivisions in different ways across the kit, toms, and cymbals. This is done in straight feel, and then a section devoted to shuffle feel. Chapter 3 shows basic rudiments including single and double stroke rolls, 5 - 15 stroke rolls, and paradiddles. Finally, there is a drum solo comprised entirely of beats and fills found within the book itself. Drumsense Volume 1 is regarded by many teachers as the clearest and most contemporary beginner�s book around, with the concepts of phrasing and orchestration forming the basis for the Drumsense Teaching Programme.